Sometimes you'll be in a situation where you want to preview a template within a campaign, but you have no reachable audience to pull from to fill in the dynamic content. Zaius will help you see that desired preview by expanding the audience, while still respecting the general definition of your segment. Why would I have no reachable audience? You are setting up a continuous cart abandonment campaign, but you only get a few cart abandoners per day, so the odds are low of someone being reachable at the exact time that you're trying to preview. You are using campaign constraints to make sure you send a campaign to recipients a maximum of once per week, and this lowers the reachable audience low enough that you may not have anyone left to preview the template for. What is changed about the audience when it is expanded? When using expanded audiences, Zaius will only modify the audience in specific ways so as to respect the general definition of the segment that you created. If you are only targeting users who have or have not been active in some timeframe, we will ignore this requirement. If you are targeting users based on if they have or have not matched, opened, or clicked certain campaigns or campaign groups, we will ignore these requirements. If you are targeting users who are subscribed to a specific list, we will ignore this requirement. If you are using a behavior in your segment definition, we will expand the timeframe to look back over all time, and also allow for any amount of delay between behavior steps. E.g., if you are targeting customers who abandoned their cart in the last hour, we will expand this timeframe to include cart abandoners from all time - even more specifically, we'll look for people who added something to their cart ever before, and then never purchased that item ever after. If you are using a behavior in a dynamic grid within ZED, and setting that behavior to be required for a customer to be able to receive the campaign, we will expand the timeframe used. 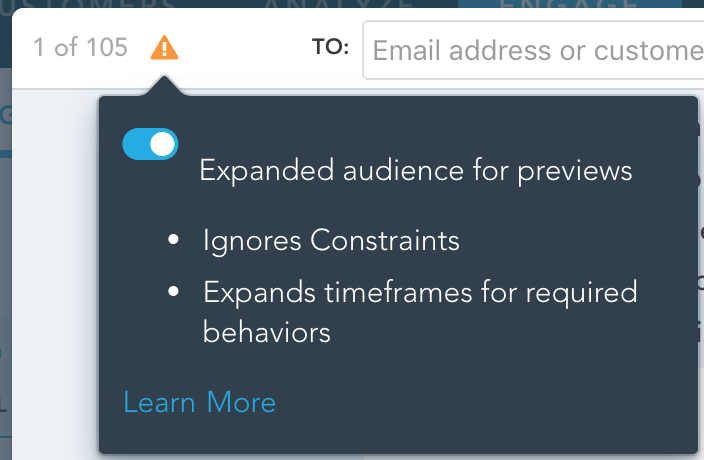 Note: we will not expand the timeframe used for non-required behaviors, as the intent is to expand the size of the audience, not to add more content to the template! Zaius will automatically attempt to expand the audience used for previews if there is no reachable audience. If we do this, you'll see a warning icon in the top-left corner of the preview modal. If you see an information icon instead of a warning icon, that means we're not expanding the audience. However, if you'd still like to manually expand the audience (e.g., if you have a reachable audience, but you want to see more sample previews), you can click the information icon to open the popover, and manually turn the toggle on. Test sends also get the benefit of using expanded audiences! If you try to send yourself a test message, and the reachable audience is zero, we'll automatically try to expand the audience to send you a message.